I have decided to move my Home Lab away from Gen III into Gen IV. In doing this I am going to follow my best practices laid out in my ‘Home Lab Generations’ and ‘VMware Home Labs: a Definitive guide’. As you read through the “Home Lab Generations page” you should notice a theme around planning each generation and documenting its outcomes and unplanned items. In this blog post, I am going to start laying out Design Considerations which include the ‘Initial use case/goals and needed Resources as they relate to GEN IV. To meet the initial use case/goals I’m will be investing quite a bit into this total refresh. Mellanox IS5022 – I liked the footprint of this device over it not having built-in IB subnet manager. An IB subnet manager is required to manage the “network paths” on an IB network. Without an active IB subnet manager available your IB HCAs will not connect. Since the IS5022 I chose does not have an IB Subnet manager I will need a place to supply this service. I can choose an ESXi Host or a Windows Host. Since my ESXi hosts will be going up and down I plan to use my Windows PC as my subnet manager as it is always on and available. 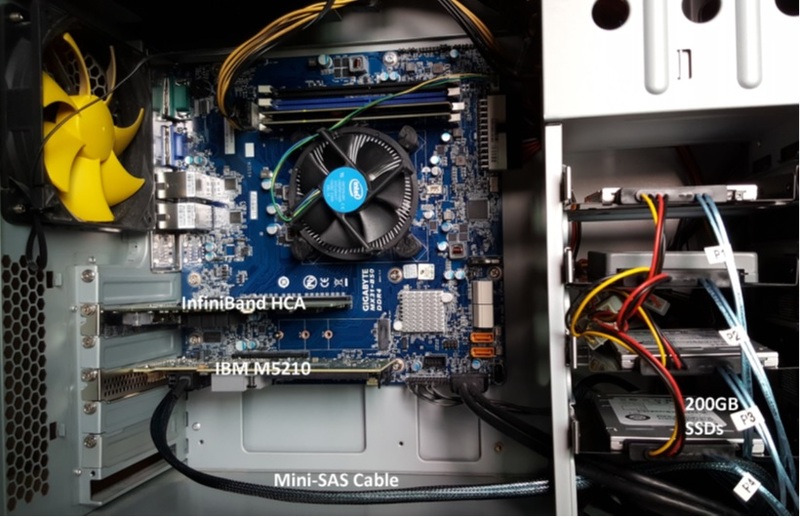 Windows PC – I repurposed my Gigabyte Z68XP-UD3, i7 CPU, 90GB SSD, 16GB of DDR3 and then bought a cheap BitFenix case to build out my Windows PC. This PC will serve as my Plex Home Media Server and IB Subnet Manager. I also plan to run Workstation 10 and set up various service VM’s (AD, vCenter Server / VUM, DNS, etc). So far it’s working pretty well but this Mobo has been known to give me issues. Next Post I’ll be going over the Gigabyte Motherboard. This entry was posted in ESXi, Home Lab, InfiniBand, Whitebox. After BIOS update was completed the Mobo powered off vs. rebooting as with previous updates. Had to power on the mobo to complete the BIOS install. Then the mobo rebooted one more time as expected. Even though the Mobo had been warm booted the BIOS Version in MergePoint web interface still showed the old version. However, the Boot BIOS screen reflected the update. A full power disconnect of the Mobo and a few ‘refreshes’ of the web browser allowed the MergePoint to report R10. I did not see this behavior with the MergePoint EMS BIOS update, it promptly reported 8.73 properly. 05/2018 –Updated on host to MX-31BS0 BIOS from R03 to R08 and MergePoint 8.58 to 8.73. 09/2017 – Updated MX-31BS0 BIOS from F10 to R03 and MergePoint 8.41 to 8.58. 03/2017 – Original update documented below. Updated MX-31BS0 BIOS from F01 to F10 and MergePoint 8.01 to 8.41. You’d think by now manufactures would have a solid and concise process around updating their products. They are quick to warn users to not update their BIOS unless there is a problem and quick to state if there is a problem they usually won’t support it. This total cycle of disservice is a constant for low-end manufacturers, heck even some high server platforms have the same issues. I have these same concerns when I started to look into updating my current MX31-BS0 Motherboard (mobo). What can soften this blow a bit? How about the ability to update your BIOS remotely? This is a great feature of the MX-31BS0 and in this blog post, I’ll show you how I updated the BIOS and the remote MergePoint EMS (MP-EMS) firmware too. My system is powered off and the power supply can supply power to the mobo. Start out by going to the IP address for MP-EMS site. From the initial display screen, we can see the MP-EMS Firmware versions but not the Platform (or Mobo) BIOS Version. Why not you may ask? Well, the MP-EMS will only display Mobo information when the Mobo is powered on. Before you power on your Mobo I would recommend opening the vKVM session so that you can see the boot screen. When you power on your mobo (MP-EMS > Power > Control > Power On ) use the vKVM screen to halt at the ‘boot menu’ or even go into setup and disable all the boot devices. In this PIC, we can see my Firmware for the MP-EMS is 8.01 and the BIOS is blank as the Mobo is not powered on. Once I saw the message the ‘BIOS firmware image has been updated successfully’ I then exited the browser session and vKVM . Note: I’d recommend closing the browser out entirely and then reopening a new session. Once I restarted my vKVM and MP-EMS sessions and then powered on my Mobo. This allowed the BIOS update to continue. Here is the patience part – My system was going from BIOS F01 > F10 and it rebooted 2 times to complete the update. Be patient it will complete. First Reboot – The system posted normally, it cleared the screen, and then white text stated a warning message about the BIOS booted to default settings. Very shortly after it rebooted again. On the 2nd reboot, it posted normally and I pressed F10 to get back to the Boot menu. I did this because next, we’ll need to update the MP-EMS firmware. Once the system had rebooted I then refreshed my MP-EMS screen and viola there it was BIOS Version F10. Once the file was uploaded I could see the Current and New versions. I then choose Update button which promptly disconnected my vKVM session and Status changed from None to a % Completed. At 100% complete my system did an auto-reboot. When I heard my system beep I then closed my MP-EMS session and started anew. Shortly after the system booted I went into the MP-EMS and validated the firmware was now 8.41. Ever heard the saying “It really is a simple process we just make it complicated”? Recent BIOS updates and overall system management sometimes feel this way when trying to do simple processes. Not trying to date myself but BIOS/Firmware updates have been around for decades now. I’ve done countless updates where it was simply extracting an update to simple media and then it completes the update on its own. Now one could argue that systems are more complicated and local boot devices don’t scale well for large environments and I’d say both are very true but that doesn’t mean the process can’t be made more simple. My recommendation to firmware / bios manufactures — invest in simplicity or make it a requirement for your suppliers. You’ll have happier customers, less service calls, and more $$ in your pocket but then again if you do, what would I have to blog about? Am I happy with the way I have to update this Mobo? Yes, I am happy with it. For the price I paid it’s really nice to have a headless environment that I can remotely update. I won’t have to do it very often so I’m glad I wrote down my steps in this blog. This entry was posted in ESXi, Home Lab, InfiniBand, Test Lab, Whitebox. To prep my Home Lab for ESXi 6.0U2 with VSAN + IB. I wanted to ensure it was in pristine condition. It had been running ESXi 5.5 + VSAN for many years but it was in need of some updates. I plan to fully wipe my environment (no backups) and reinstall it all. Yes, that’s right I’m going to wipe it all – this means goodbye to those Windows 2008 VM’s I’ve been hanging on to for years now. Tip: If you’d like to understand my different Home lab generations please see my dedicated page around this topic. In this post, I am going to focus on listing out my current to-do items, then describing how to flattening all SSD/HDD and finally building a custom ESXi 6.0U2 ISO with Realtek 8186 drivers. Once I created the BOOT CD and allowed the product to boot. I was quickly able to see all the HDD / SDD’s in my Host. After choosing ‘Delete All Partitions’ for all my disks I clicked on ‘Apply’ in the upper right-hand corner. The following window appeared, I choose ‘Yes’ to Apply pending changes, and it removed all my partitions on all my disks quite quickly. ESXi no longer supports RealTek Network drivers, so home lab users who need these drivers will have to create a custom ISO to add these drivers back in. Keep in mind these are unsupported drivers by VMware, so use at your own risk. My trusty ESXi-Customizer GUI program is no more for ESXi 6. It has moved to a CLI based product. However, PowerCLI has all the functionality I need to build my customer ISO. In this section, I’ll be using PowerCLI to create my ISO. Keep in mind these are the steps that worked for me, your environment may vary. To get started you will need two files and PowerCLI Installed on a Windows PC. –POWERCLI COMMANDS— For each command, I have included a screenshot and the actual command allowing to copy, paste, and edit into your environment. And that’s it… now with my clean/updated hosts, flatten HDD/SDD’s, and a newly pressed custom ISO I am ready to install ESXi onto my systems. Next Steps for me will be to install ESXi, AD/DNS VM, and vCenter Server Appliance. However, my next post will be focused on getting InfiniBand running in my environment. I’ve been running ESXi 5.5 with VSAN using a Netgear 24 Port Managed Gig switch for some time now, and though it has performed okay I’d like to step up my home lab to be able to support the emerging vSphere features (VSAN 6.x, FT-SMP, and faster vMotion). To support some of these features 10Gb/s is HIGHLY recommend if not fully required. Looking at 10Gbe switches and pNICS the cost is very prohibitive for a home lab. I’ve toyed around with InfiniBand in the past (See my Xsigo Posts here) and since then I’ve always wanted to use this SUPER fast and cost effective technology. Initially, the cost to do HPC (High-performance computing) has always been very expensive. However, in recent years the InfiniBand price per port has become very cost effective for the home lab. Let’s take a quick peek at the speed InfiniBand brings. When most of us were still playing around with 100Mb/s Ethernet InfiniBand was able to provide 10Gb/s since 2001. When I state 10Gb/s I’m talking about each port being able to produce 10Gb/s and in most cases Infiniband switches have a non-blocking backplane. So a 24 Port InfiniBand Switch, 10Gb/s per port, Full duplex, Non-blocking switch will support 480Gb/s! Over time InfiniBand speed has greatly increased and over time the older switches have dropped in price making InfiniBand a good choice for a growing home lab. For most home labs a 40Gb/s per port QDR switch is financial achievable. Even the 20Gb/s DDR or 10Gb/s SDR switch give ample speed and are VERY cost effective. However, step above QDR and you’ll find the price point is a bit too steep for home lab use. So let’s take a look at the price / speed comparisons for InfiniBand vs. 10Gb/s Ethernet. Let’s break this down a bit further. I used the high dollar from each line item above and figured 3 x HCAs or pNICs and 6 cables for my 3 hosts. From these costs you can clearly see that InfiniBand is TRULY the best value for speed and port price. Even if you got a great deal, let’s say 50% off on 10Gbe, it still would be slower and it would cost you more. Heck, for the price you could easily buy an extra switch as a backup. With this in mind my plan it to replace my backend Gbe network with InfiniBand. Using IPoIB (IP over InfiniBand) for VSAN, vMotion, and FT traffic and my 1Gbe network for the VM’s and ESXi management traffic. However, without knowledge wisdom cannot be achieved. So, my next steps are to learn more about InfiniBand and review these great videos by Mellanox. Then come up with a plan to move forward using this technology. Check out these Videos: InfiniBand Principles Every HPC Expert MUST Know! This entry was posted in ESXi, Home Lab, InfiniBand, Virtual SAN, VSAN.